Vaccination is one of the most basic and critical health needs in emergencies to protect populations from the risk of contracting deadly but preventable disease. The risk of measles and polio in Syria remains extremely high; as such, WHO urges all health partners to rebuild confidence in vaccination and ensure that all children have access to life saving vaccines. The anti-vaccine community, eager to seize upon any hint of vaccine injury, simply concluded that the vaccine itself was to blame, rather than taking a more nuanced and cautious approach to the incident. In their zeal to villify the MMR, they rushed to judgment. 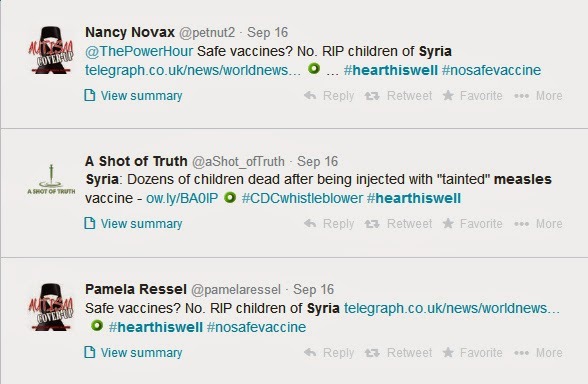 Indeed, one anti-vaccine activist, Anne Dachel, opined, "So will this be due to cyanide, with absolutely nothing to do with the vaccine itself? PR will be working 24/7 to exonerate the MMR." Dachel preemptively dismissed any conclusion that did not blame the measles vaccine. Now that it has been shown that the vaccine itself actually was not to blame, don't hold your breath waiting for Ms. Dachel to write anything clearing the vaccine. I have not seen one member of that community come out and say, "No, we were wrong. It wasn't the vaccine." Ideology trumps all, it seems. Despite the claims that this was vaccine injury, this wasn't a case of vaccine injury. Unfortunately, the fact that it was human error, rather than the vaccine, is little comfort, especially to those families whose children died because Atracurium was used instead of the vaccine's diluent. While I can understand how it happened, this never should have occurred. The vials for the muscle relaxant and the vaccine diluent are reportedly very similar, but that is no excuse. Those packing the vaccine packs ought to have had double-checks in place to ensure they were put together properly. In fact, the Atracurium never should have been anywhere near where the vaccines were stored. If separate storage was not available, then extra safety checks would have been all the more important. It is going to take a long, long time for trust to be reestablished after this tragic event. And in the meantime, children will contract measles. Most will recover. Many will suffer through a severe course of illness. And some will die from the disease.